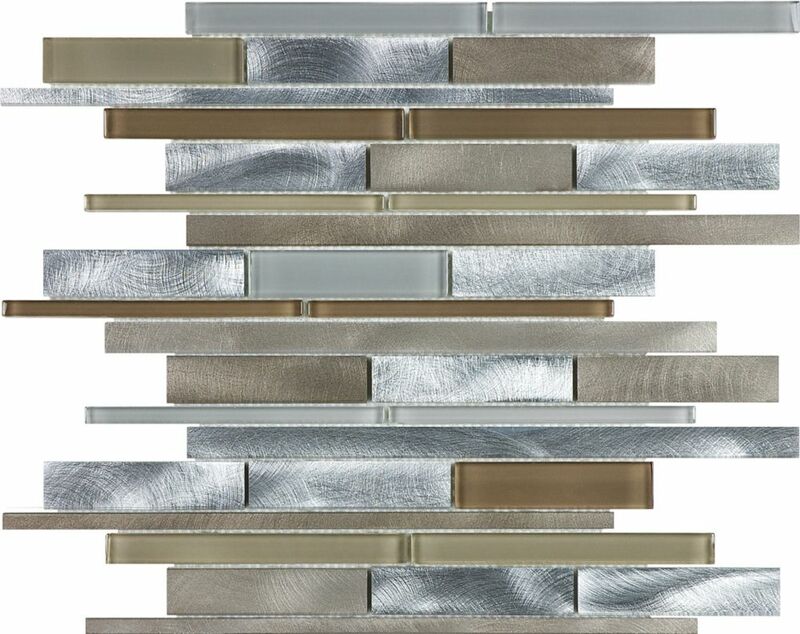 Boutique selection of glass and brushed aluminum blend mosaics with contemporary, cool tones for trendy settings. Adhesive tiles, brushed aluminum. Copper coloured. Simple and fast installation. Easy maintenance. Without grout. Can be installed on any wall, except in the shower or on gas stoves backsplashes. Adds a luxury touch to the room. MS International Canyon Creek Ledger Panel 6 in. x 24 in. Wall Tile is a Natural Stone Quartzite with grey tones. Seemingly random strips of tile are glued together to form a panel that is easy to install. This frost resistant tile is suitable for indoor or outdoor walls in residential and commercial installations. Note: Inspect all tiles before installation. Natural stone products inherently lack uniformity and are subject to variation in color, shade, finish, etc. It is recommended to blend tiles from different boxes when installing. Natural stones may be characterized by dry seams and pits that are often filled. The filling can work its way out and it may be necessary to refill these voids as part of a normal maintenance procedure. All natural stone products should be sealed with a penetrating sealer. MS International Casa Blend 3D Multi Finish Ledger Panel 6 in. x 24 in. Wall Tile is a Natural Stone Travertine with neutral cream tones. Strips of stone are stacked and glued together to form a 6 in. x 24 in. panel that is easy to install. The stepped pattern continues the natural randomness. This tile can easily be laid in a pattern or single layout and is suitable for residential and commercial installations. Note: Natural stone products inherently lack uniformity and are subject to variation in color, shade, finish, etc. It is recommended to blend tiles from different boxes when installing. Natural stones may be characterized by dry seams and pits that are often filled. The filling can work its way out and it may be necessary to refill these voids as part of a normal maintenance procedure. All natural stone products should be sealed with a penetrating sealer. MS International Gold Rush Ledger Panel 6 inch x 24 inch Wall Tile is a Natural Stone Quartzite with brown tones. Seemingly random strips of tile are glued together to form a panel that is easy to install. This frost resistant tile is suitable for indoor or outdoor walls in residential and commercial installations. Note: Inspect all tiles before installation. Natural stone products inherently lack uniformity and are subject to variation in colour, shade, finish, etc. It is recommended to blend tiles from different boxes when installing. Natural stones may be characterized by dry seams and pits that are often filled. The filling can work its way out and it may be necessary to refill these voids as part of a normal maintenance procedure. All natural stone products should be sealed with a penetrating sealer. Random Strip Mosaic Blend Tile in Espresso Boutique selection of glass and brushed aluminum blend mosaics with contemporary, cool tones for trendy settings. Random Strip Mosaic Blend Tile in Espresso is rated 4.3 out of 5 by 3. Rated 5 out of 5 by Arp13 from Love the colours We are just in the process of putting the tiles in the kitchen as our backsplash and we absolutely love them! The colours are rich and warm and make the perfect connection to bring it all together! The chrome accents sparkle like jewels! Beautiful! Rated 3 out of 5 by Agsf from Can be a pain to grout Need a good tile saw to cut them as they are a mix of glass and aluminum. The aluminum strips are hollow channel so takes a lot of grout. However they look fantastic when done. Rated 5 out of 5 by Didi from Makes an Impression I fell in love with the mosaic blend expresso tiles as soon as I saw them! They are very contemporary and smart looking. I was going to use them in my main kitchen as the colours went perfectly with my decor. However, I soon decided that the look would be much too busy for the space as the kitchen is between my dining room and den in an open concept. They would have worked only if the kitchen was its own room with no other designs intruding. So, beware, they do give a very busy strong look so be careful that they will work in your area and won’t overpower your space. The way I figured this out was I left a few samples of the tiles in various areas in my kitchen for a month or two before making my decision. The colours worked perfectly but the busy mosaic pattern was definitely too strong for my itchen and competed with other items in the room. I’m glad I realized this in advance as living with the strong pattern would have made me dizzy! I loved the mosaic tile expresso blend tiles so much that I really wanted to use them somewhere. I ended up using the them in my media room. I have black cabinets and gray flooring and a gray quartz countertop in the mini kitchen. The room is very plain so the tiles became the main focus. They are stunning and not too busy because the surrounding decor is simple and neutral. The metal strips in the mosaic are gorgeous and blend nicely with the stainless steel appliances and cabinet pulls. The colours of the glass strips are also beautiful with a hint of blue in some which went great with my gray countertop. Everyone who walks into the room says “wow”! These tiles are really beautiful if you find the right room for them. They would go best with white cabinets or black cabinets. They are actually slightly darker than the photos show. A word of caution: the tilers I hired did a bad job. If you look closely the strips are not straight and they did not blend the colours and patterns properly as designed. No one else notices but I am very disappointed. My advice is to hire a tiler who has had experience with mosaic tiles, such as the guys that install for Home Depot.